Last Thursday, my husband and I were fortunate enough to attend To Kill a Mockingbird, a movie event hosted by NCM Fathom Events, Turner Classic Movies and Universal Pictures. 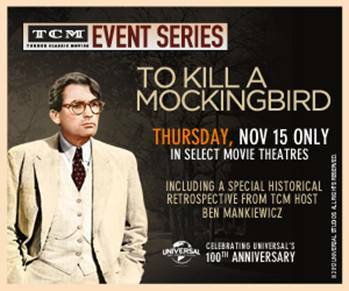 The movie played in select theaters across the country as a way to commemorate the 50th Anniversary of To Kill A Mockingbird starring Academy Award® Winning Actor Gregory Peck. I just love To Kill a Mockingbird in any format! It's my all-time favorite novel and it's one of my very favorite movies too. It was such a treat for me to finally see it on the big-screen. In no way, do I feel that I can ever write a "review" for it because as far as I'm concerned, everything about the movie (and the book for that matter) is just about perfect. I have to admit that my husband wasn't exactly thrilled that we were attending To Kill a Mockingbird on a rare date night. He hasn't ever read the novel so he doesn't have the love for Ms. Lee's story like I do. And I had already "made him sit through it" (his words) once before. However, I do think he enjoyed the movie and all of its powerful messages. We were both blown away (although he probably wouldn't use those words) by Gregory Peck's portrayal of Atticus Finch. In my opinion, it is quite possibly the best performance ever, but I'm a little biased! One of the highlights for me of seeing this movie was the feature prior to the movie. My husband was getting a little impatient, but I was fascinated by anything and everything relating to this story. Although I've read a lot about the book and the movie, I still managed to learn some interesting tidbits. Many of the facts that they shared are included in this link about TKAM trivia! And finally, I found that there is a new 50th anniversary DVD issue of To Kill a Mockingbird that just came out this year. Guess what's going on my Christmas wishlist? Thanks to Harper Collins and Fathom Events for providing the movie passes. I love how the theaters are featuring classic movies. What a great way to view these old favorites! I so love this movie. LOVE. It is just such a mix of precious and heartbreaking. I guess I had a built-in love for it because it is by far my mom's favorite book and movie, and I've been hearing about it for most of my life. I was surprised by how full the theater was, tbh! I didn't realize the extra features started early so I missed some of them. It was such a treat to see a movie like that in the theater. The theater here was packed - I had trouble finding a seat - and the audience clapped when it was over. I missed the extras too...bummer. Ah well...it was good none the less.